Sights To See in Washington, D.C.
En español | Wandering around Washington, D.C., is like watching the pages of American history come to life. Many of the best (and free!) 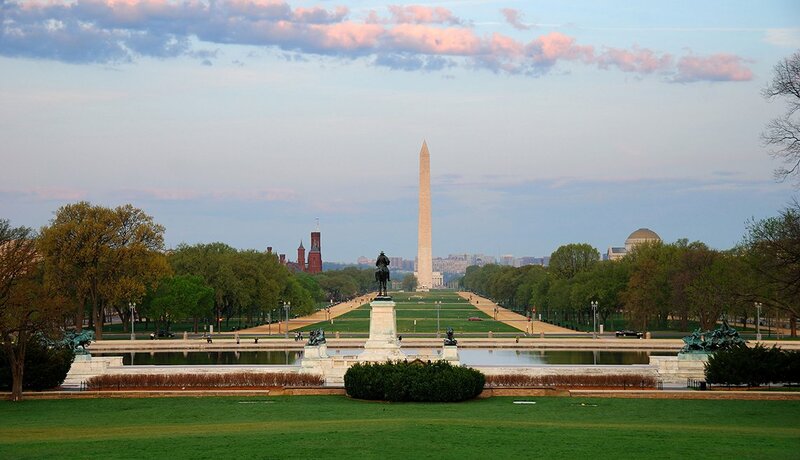 monuments stand on one picturesque side of the National Mall. 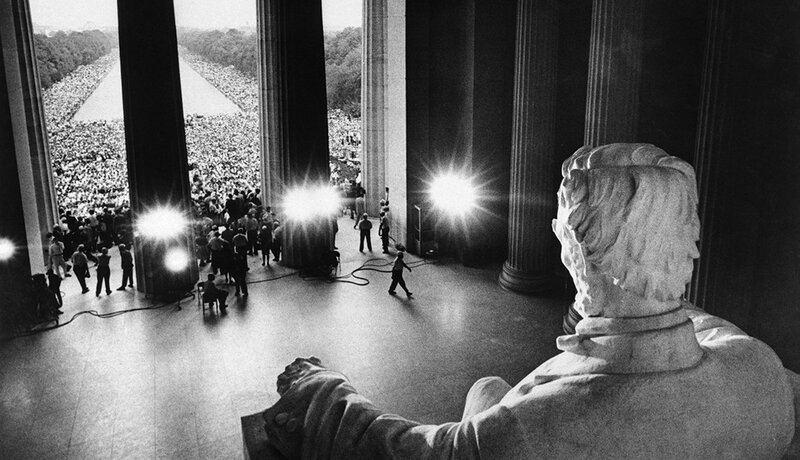 Just about any day — or night, when the monuments look especially dramatic — is a good time to (re)acquaint yourself with our nation’s past. 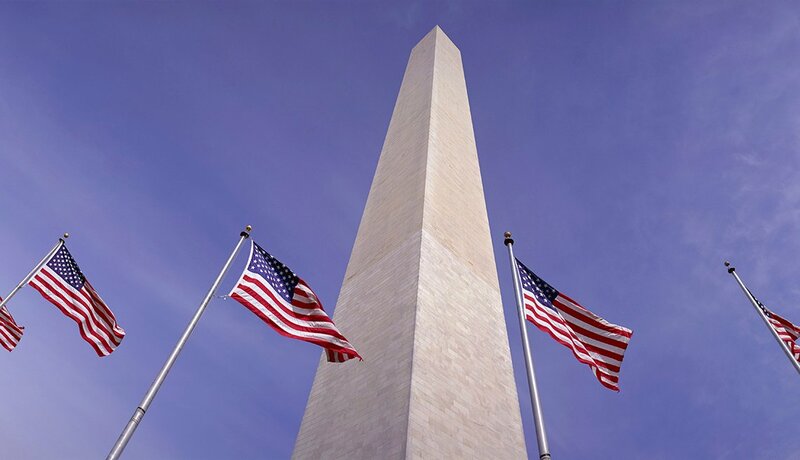 At just over 555 feet, this towering tribute to our nation’s first president is perhaps our most iconic monument. 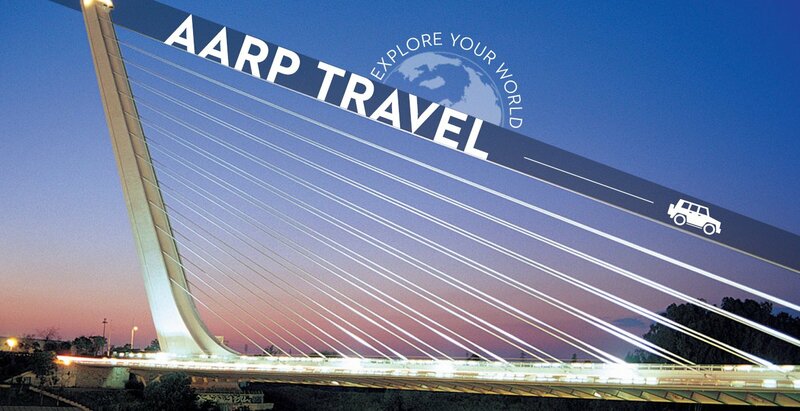 See the slightly different shade of the structure’s top two-thirds? Construction began in 1848 but stalled thanks to money and political problems in 1854, meaning marble from a different quarry had to be used when work resumed in 1877. 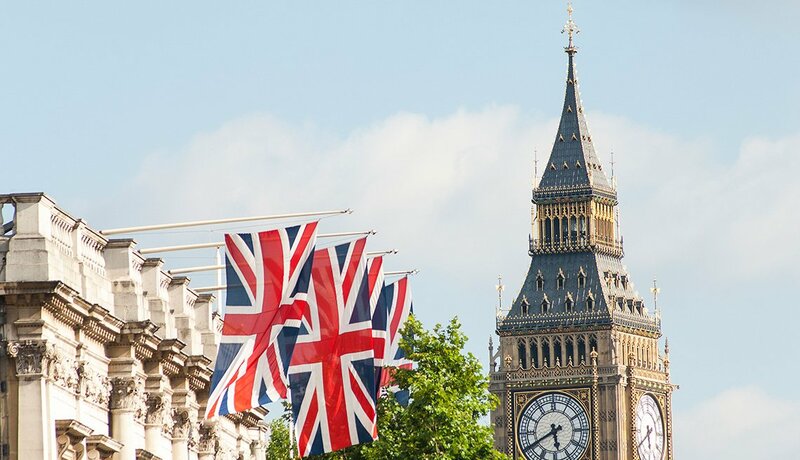 The observation deck offers spectacular views of the capital, but reserve your free tickets in advance; ongoing repairs occasionally require the obelisk to close. A pensive Abraham Lincoln, carved to perfection by American sculptor Daniel Chester French, stares down from his perch inside this Greek-style temple on the west end of the National Mall. Count the fluted Doric columns outside and you should come up with 36 — the number of states in the Union at the time of Lincoln’s death on April 15, 1865. 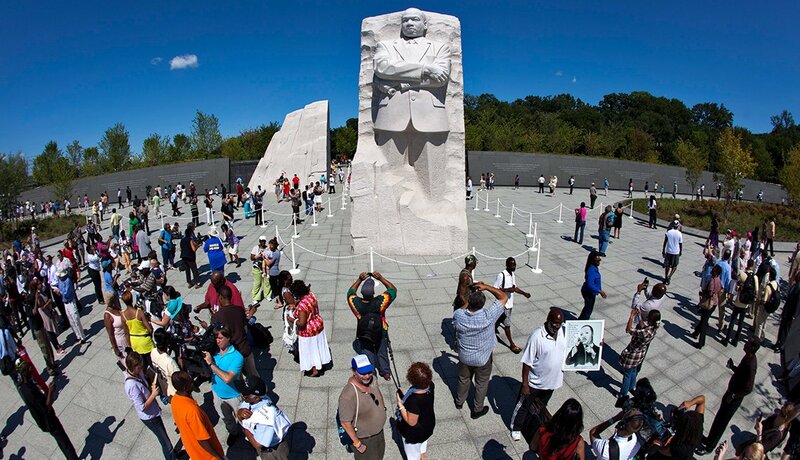 Equally steeped in history are the steps between the memorial and the Reflecting Pool: They were the site of Martin Luther King’s “I Have a Dream” speech. 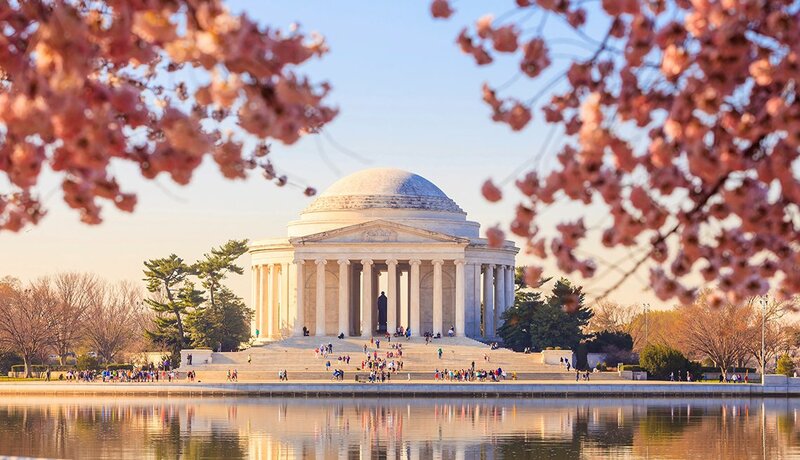 Its reflection shimmering in the Tidal Basin, the Pantheon-like Jefferson Memorial shows its best side during cherry-blossom season in the spring (the flowering trees practically surround it). The gleaming white of the columned rotunda perfectly recalls the classical building style for which scholar/architect/President Jefferson was known. Except at peak bloom times, the steps can be an excellent spot for quiet contemplation. Interjecting itself in an imaginary continuum of freedom from Lincoln to Jefferson, this memorial is one of the more recent entries in the roster of Washington monuments; it opened to the public in August 2011. Take time to contemplate King’s quotes etched upon the gracefully curving Inscription Wall. “Powerful” and “inspiring” only begin to describe the force of his words. As stirring as it is austere, the Vietnam Veterans Memorial brings home the casualties and consequences of a controversial war. 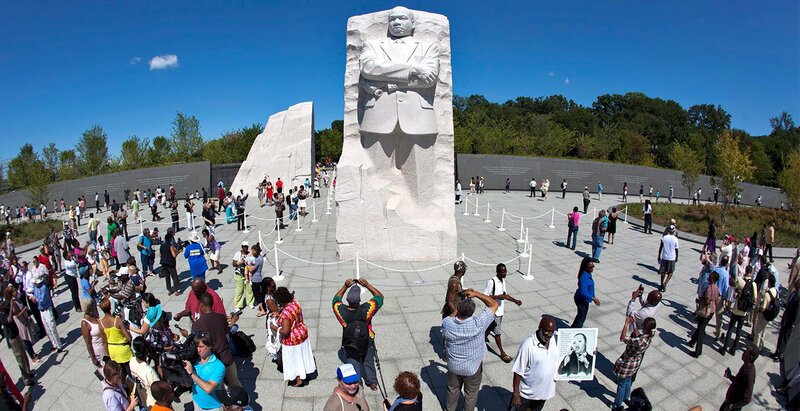 Its stark black marble distinguishes it from the white masonry that dominates the bulk of the Mall. 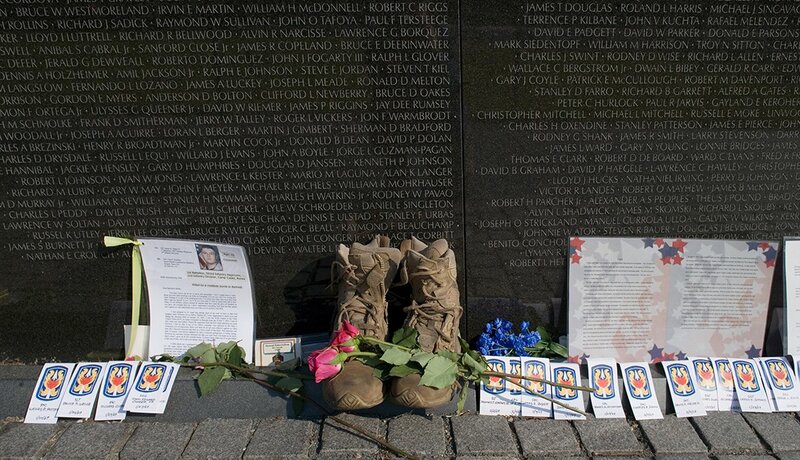 Engraved in that dark stone are the names of more than 58,000 U.S. servicemen and women who died or went missing in Vietnam. Thirty-four years after its dedication, it’s hard to believe the memorial was designed by a 21-year-old Yale student, the artist Maya Lin. 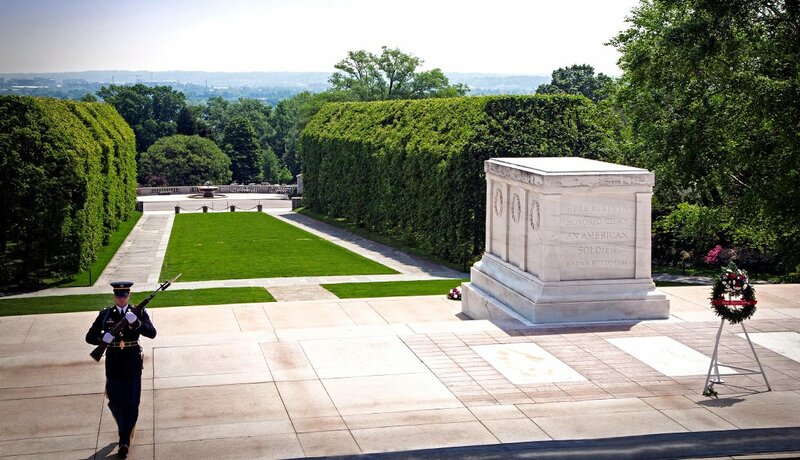 Because it lies across the Potomac River from D.C. in Arlington, Va., this hallowed resting ground of war veterans and presidents is not technically a Washington monument. Yet the site is undeniably a magnet for national remembrance. Identical stout white pillars march across the greenery in serried and seemingly endless rows. Notable monuments within the cemetery include the Tomb of the Unknown Soldier and memorials honoring John F. Kennedy and the Challenger space-shuttle astronauts. 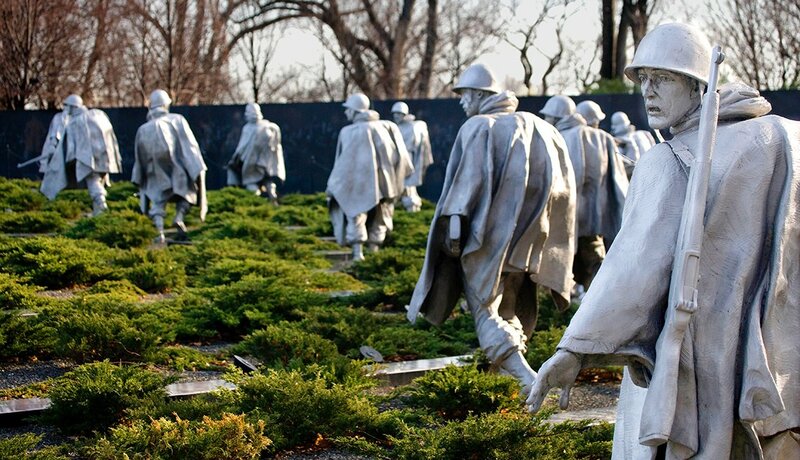 A stainless-steel poncho appears to billow in the wind from the shoulders of all 19 soldiers memorialized in metal here; though the haunting figures represent an infantry platoon on the march during the Korean War, the site commemorates the sacrifices of every U.S. service branch during the conflict. Look closely at the adjacent Wall of Remembrance, a mural made of 2,400 Korean War photos etched in black granite: The number resulting from the reflected figures symbolizes the 38 months of the war’s duration, as well as the 38th Parallel that divides North and South Korea to this day. 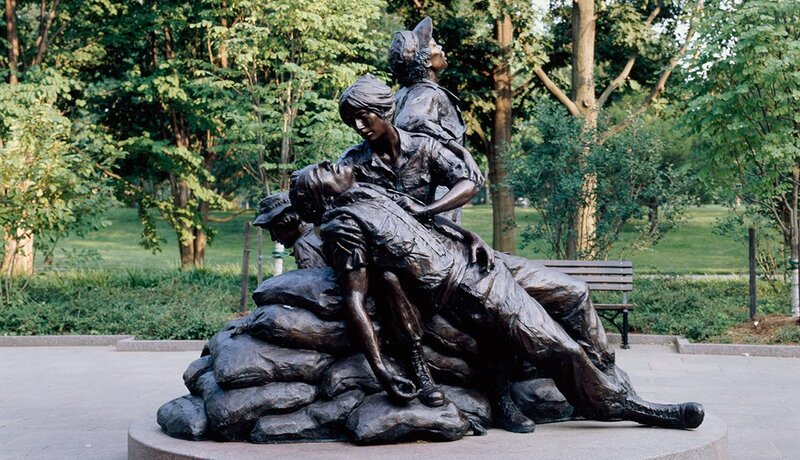 Tucked into a grove of trees on the grounds of the Vietnam Veterans Memorial, this first national monument to female veterans, dedicated in 1993, depicts three women tending a wounded soldier. Though the trio is clad in fatigues, designer Glenna Goodacre purposely omitted any identifying insignia, symbolically honoring the thousands of military and civilian women who played crucial roles in the Vietnam War. Is it a hidden garden or a traditional memorial? 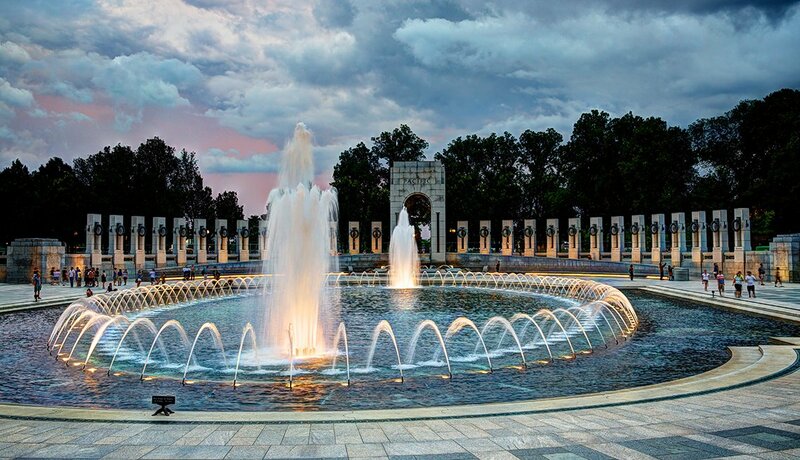 Set along the Tidal Basin, the four outdoor galleries here — representing FDR’s four terms in office — are filled with sculptures, murals, waterfalls and areas for quiet reflection about the weighty issues that confronted our 32nd president from 1933 to 1945. 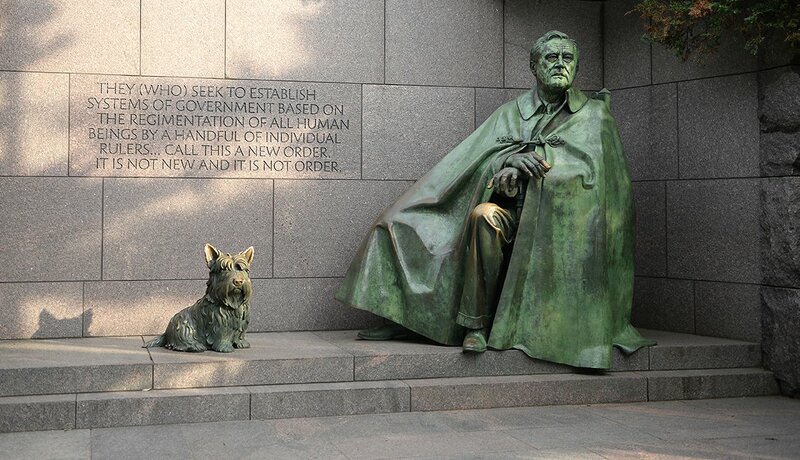 Though accessible to those with disabilities, the memorial did not receive its bronze statue of FDR in his wheelchair until four years after its 1997 dedication; it took Congress that long to decide his struggle with polio could be an inspiration to others.